Vampires have truly become a mainstream phenomena and we’ve seen everything from books to TV series and a wide gamut of films... let's not mention the "T" word though. 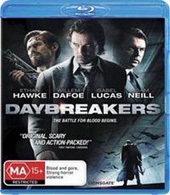 But as a cliché, many of these ideas feature those dark and brooding vampires, however Daybreakers by Australian writers/directors Michael Spierig and Peter Spierig have added a unique twist to this vampiric legacy. At times, Daybreakers is reminiscent of The Matrix where machines have become the alpha power on Earth, however in this movie, it is the vampires. Humans on the other hand, are now a commodity for these blood suckers who are farmed for their blood. But just like in the real-world, vampires have forced humans to become an endangered species. The main protagonist in Daybreakers is Edward Dalton (Ethan Hawke), a vampire haematologist who is attempting to master an artificial blood substitute for his employer, Bromley Industries. However as the hostilities towards those vampires in power begins to escalate, holding order on this world is quite a difficult prospect, especially when blood begins to be rationed out. In the film, vampires have employed a variety of techniques to keep them alive such as alarms to warn them of sunset or day suits which allow them to walk in the sun. But their world is far from perfect, especially when a small group of humans exist to thwart their plans led by Lionel McCormack (Willem Dafoe) or Elvis to his friends. To complicate things even more, those vampires who have gone without human blood for too long, have become subsiders, mindless and violent animalistic bat like creatures. Needless to say, things are grim. However, during Dalton’s search for a synthetic form of human blood, he unwittingly stumbles across a group of freedom fighters who are led by a former vampire Elvis who believes that he has the cure for this shattered world. Thus begins a battle of good versus evil is this epic action movie about one of the world’s most sort after genres, vampires. With a merging of ideas and genres, The Spierigs have created a clever movie that is only made better by the brilliant acting of Dafoe and Hawke who really get into their character. Sam Neil also stars in Daybreakers as the nefarious CEO of Bromley Industries and truly encompasses his character with a penance of evil. As the movie was filmed in Australia, we have several great aussie actors gracing this movie as well that include the beautiful and talented Claudia Karvan and Isabel Lucas who add a touch of realism to this very dark film. On Blu-ray, the video quality looks brilliant in FULL HD and even though the movie is quite muted at times due to the dark colours and environments, the images are quite sharp and the attention to detail is very impressive. Match that with DTS-HD Master Audio 7.1 and you have one impressive cinematic treat from the comfort of your home. When it comes to special features this disc has quite a bit from audio commentary by the writers/director to featurettes, trailers and a short film called the Big Picture. Not bad indeed! If you can’t get enough of vampires, than I would strongly recommend Daybreakers because not only does it attempt to break some of the stereotypes, it’s a thoroughly enjoyable movie from start to finish and challenges this already stagnant genre.